I've mentioned Vienna's colorful outdoor Naschmarkt food market here and here, and since we went there again this weekend, I thought it was time to dedicate an entire post to the place. First of all, yes, Bratislava has its own outdoor market, known as Mileticka, and while it has plenty to recommend it and we love to go there, it does seem to lack certain things that can be found in abundance at Naschmarkt, and which we used to be able to find with relative ease back "home" in Berkeley and Oakland (Naschmarkt is the closest we've found to places like Monterey Market, Berkeley Bowl, or the Lakeshore Farmers' Market, as well as the awesome Mercato Saint Ambrogio in Florence, Italy). (Nevertheless, while I did brush on Mileticka here, I intend to do a more thorough post on it as soon as possible). Naschmarkt is a sprawling outdoor market built over what was once an exposed canal that meandered through Vienna. Local chefs brag about sourcing their ingredients from the market's vendors. Hordes of people, both locals and tourists, cram its narrow aisles and jostle for glimpses of the beautifully laid out, fresh seasonal produce, as well as the amazing looking artisanal cheeses, freshly made pastas, and the fresh products of butchers and fish mongers. Naschmarkt is also a good place to find some potent truffle oil or a nice bottle of aged balsamic vinegar. Several vendors sell an array of Indian and South East Asian spices, so if you're looking for some curry powder or cardamon to make some Thai or Indian curry, this is the place to go. The wonderful scents that permeate the air and bombard the senses are completely intoxicating. Naschmarkt also comes in handy if you're looking for a cheap lunch in a city that's otherwise known for being on the pricey side with food (at least compared to Bratislava). For 3 euros you can get a massive and tasty chicken or lamb kebab sandwich from a guy with a cool Morrissey pompadour and sideburns, and there are also falafel stands as well as a woman who makes grilled fish sandwiches, which we haven't tried, but they smell amazing, encrusted as they are with herbs and seasoning. 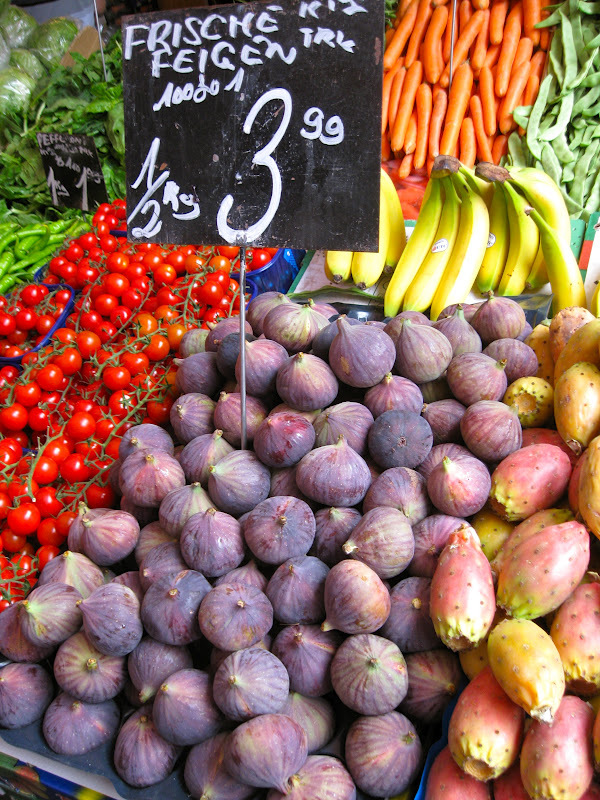 However, part of why I was so excited to go to Naschmarkt this weekend is because fig season has arrived (! ), and we have not seen any figs at Mileticka so far. Maybe they will start to appear as the lamentably short fig season progresses (fig season really only lasts from most of August through September, winding down in early October), which would be nice. Terezia actually spotted some in Tesco in a small container, but they looked kind of sad. I just don't know if figs are popular in Slovakia. But at Naschmarkt there was an explosion of figs. 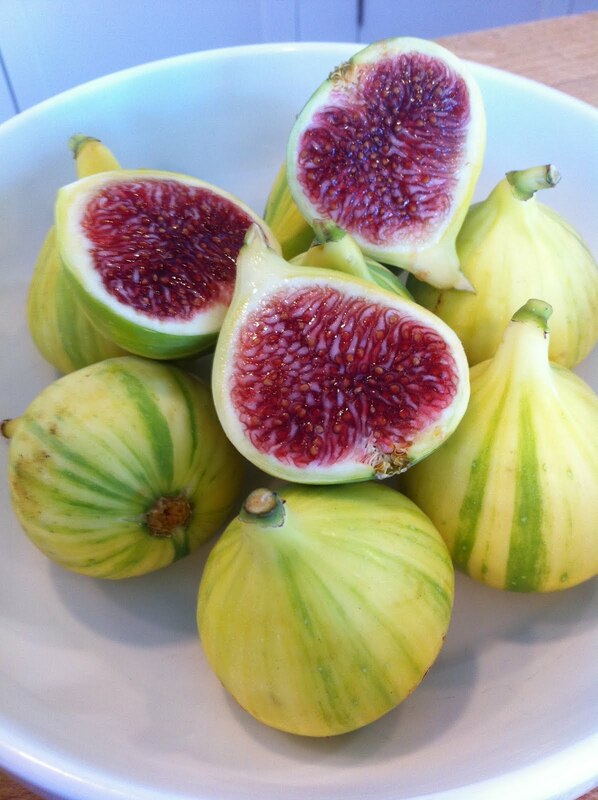 Many of the produce vendors were selling beautiful, plump, purple turkish figs, as well as what are known in California as black mission figs (brought to CA from Spain by missionaries). We bought figs from 3 separate vendors. Figs are my favorite fruit, but there is a science to picking the best ones - perfect figs can be somewhat elusive. A perfectly ripe fig has a complex flavor - sweet but with a bit of sourness to balance it out - with a soft fleshy consistency. The inside (of the varieties that we prefer) should be bright crimson and will glisten just like raspberry jam. It should almost look like something you could spoon out and spread on toast. Figs are a tricky fruit to deal with: they have to be picked at just the point when they are ripening and then rushed to the market before they turn to mush. If picked too early when they are still rock hard, figs don't really continue to ripen properly like most other fruits, so you can't buy a bunch of hard ones and expect them to ripen and become edible later in the week. When selecting them, feel is incredibly important. They need to be pretty soft but still just firm enough so as not to indicate that they're bruised or too old. When medjool dates are in season, Naschmarkt is again the place to go. The only medjool dates I've seen in Slovakia were the totally dried out and disgusting prepackaged ones that are akin to chewing on a tire. But last winter at Naschmarkt we bought some beautifully soft, tender, deep amber colored medjool dates. When they're perfect, they melt in your mouth like butter and offer an earthy sweetness that's intense and almost caramel like without being cloying. Medjool dates are like an artisanal dessert plucked straight from a tree. When I eat them I just want to lie on the floor in a date-enduced stupor. Naschmarkt vendors also have piles of wild mushrooms, another favorite of ours. Some tables on Saturday were overflowing with beautiful, fleshy, golden chanterelles - an awesome type of mushroom we have not seen sold in Slovakia. We also saw some good looking porcinis - something I know grows in abundance in Slovakia's forests, but which we have not seen being sold at Mileticka (except on one occasion when some people were selling a handful of really old and messed up looking ones out of a bucket). Notice that pile of golden chanterelles. Yum! Another curious difference between Mileticka and Naschmarkt: in winter Mileticka is practically dead, while Naschmarkt is still overflowing with in-season produce and hungry customers. We took our first trip to Mileticka last winter and we were shocked at how only a handful of vendors were open, selling nothing but apples, squash, and potatoes. Naschmarkt, by contrast, had those typical winter standards, plus piles of fresh wild mushrooms, heaps of medjool dates, mountains of lovely winter greens, and anything else you can imagine that is in season during winter. Do people in Slovakia just stop buying produce in winter? Are they content to subsist on all the stuff they'd pickled for winter, or on the potatoes stored in their root cellars? Not my photo: Naschmarkt also has a slew of restaurants, from casual to kinda upscale. It could also be that while Naschmarkt is closer to the center of town and easily accessible to both locals and tourists, Mileticka sits well outside the historical center and involves a 10-15 minute tram ride out toward Ruzinov, meaning that it remains totally off the radar of all but the most brave and adventurous tourists. However, as nice as Naschmarkt is, it lacks the grittiness and local color of Mileticka. Next time we go to Mileticka, I'm bringing my camera so I can properly document the experience for a future blog post.